1. In small bowl, combine egg substitute, jalapeno cheddar, green pepper and onion. 2. Lightly coat nonstick skillet with spray margarine; add egg mixture and cook until set, turning once. 3. 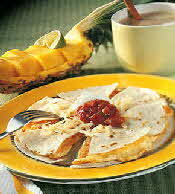 Heat tortillas in microwave until warm, about 30 seconds. Sandwich egg mixture between tortillas and top with cheddar. Cut into wedges and serve with salsa and yogurt.